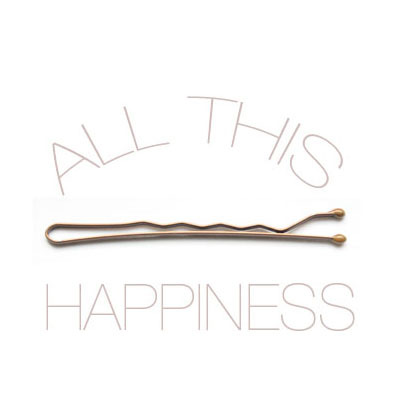 all this happiness: Laundry Days. I'm waffling today on what to do with my evening. I could, given that I am not required to be up particularly early tomorrow, go see Carly Rae Jepsen for a reasonable ticket price and bounce around to my heart's content by myself. I could also stay home, plug in my headphones and play Emotion, and throw a whole mess of recent antique/vintage acquisitions in buckets and play laundress. It's not an easy choice for me, I swear! 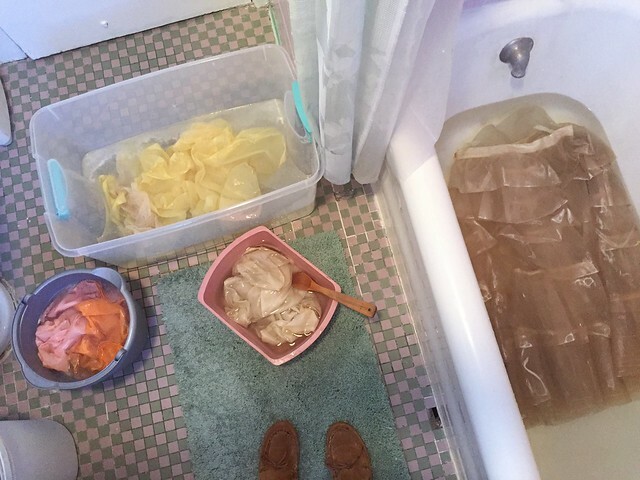 Were it between regular laundry and this show I wouldn't be debating at all--even though regular weekly laundry is infinitely easier than dunking some chiffon thing into a tub and praying it doesn't disintegrate. It's oddly satisfying, maybe even fun? The suspense is sometimes enjoyable even (when it works out), like yes, I have saved this garment, this textile is new again, I have saved it, I am a genius! (For the record, I didn't do either. After work I was too tired to go stand around at a show for several hours--this is how I know I am now old--even if I went late and missed the opening acts, I just couldn't muster up the energy for that kind of environment. Mom and I went to visit a friend who had surgery, then ordered a pizza and made a salad so really, I'm pretty happy with that activity too. I did finally get to my exciting laundry on my day off yesterday). I don't dry clean. I mean, sometimes I do. For coats and things like that, but anything that can't go in the washing machine, vintage or new, I hand wash. 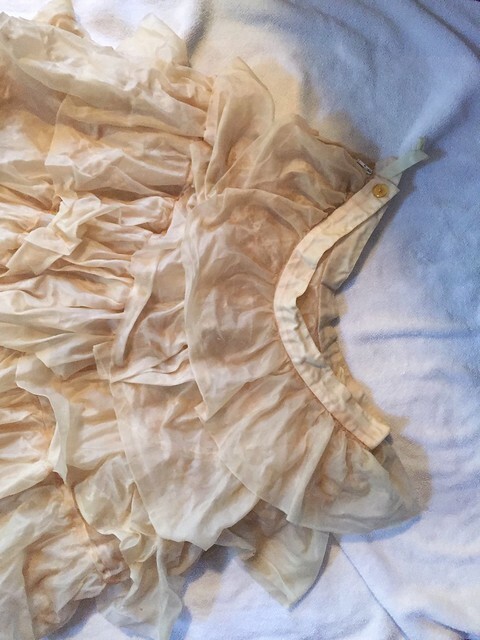 Sometimes this ends in tears despite all kinds of resources on the internet with instructions on what to use or not used on various textiles (once, early in my collecting, I dunked a black crepe 1940s dress in a bunch of hot water and it shrank to toddler size). It's all very helpful but in the end I suspect there's nothing like trial and error. I'm not really interested in writing a tutorial for this--there are enough of those out there, better researched and written--and really I don't have much to say on the topic besides lukewarm water (maybe cold water? Sometimes I use cold but in the interest of keeping things as gentle as possible lukewarm makes more sense to me. I'm also a wimp with cold hands who doesn't want to dunk them into ice water), soap flakes (which is a really satisfying thing to make even though grating a bar of soap really, really makes me want to eat it because it looks like cheese), and oxyclean. Which I know can be dangerous but sometimes I just gotta dunk those yellowed whites. I usually get a few buckets going, along with an old strainer we used to use for pasta until the stand on the bottom of it broke off. I throw on some podcasts (lately The Black Tapes. 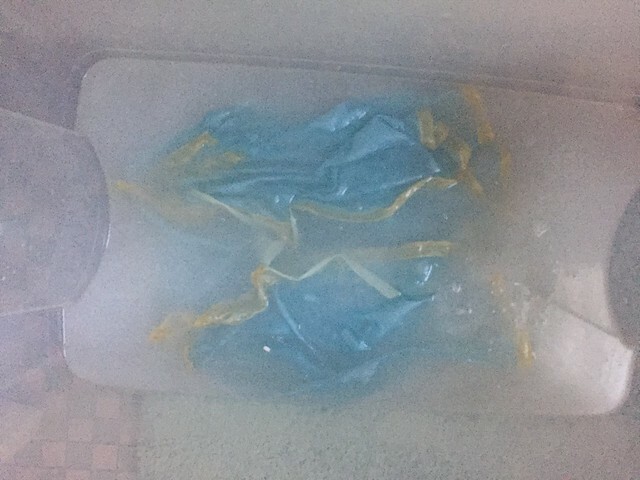 Even though one episode scared me and I had to skip it and then had nightmares anyway) and leggings and get all my potions going in the bathroom, occasionally poking their contents with a spoon, wrapping wet things in towels, hanging them to dry, getting really grossed out by the yellow dust-bowl colored water that has that really distinct old wet clothes smell? What is that? It's not the same as a thrift-store smell, it's much clingier, sort of swampy and alive instead of stale. There's something I like about it. The typical line of thinking would be I enjoy bringing something old back to life, the usual vintage collector's song, but I suspect for me it's more in line with the peace of doing something tangible? The end result is great but I like something about the process, the suspense, the puzzle of what it takes to get a stain out. Or maybe I'm just excited to wear something new. The next step, the mending. That part I'm pretty bad about. I let the piles sit around for months, usually until I want to wear one of the pieces in it, and only leave myself 15 minutes to fix it before I have to be somewhere. Better late than never? 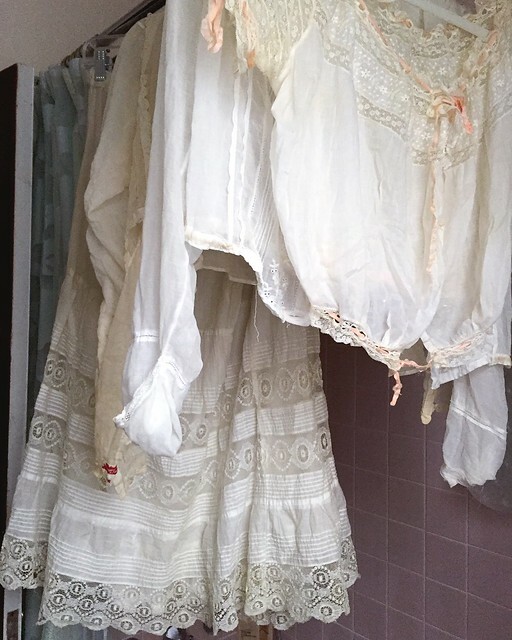 Your collection of antique clothing is beautiful. The colors are so springy! 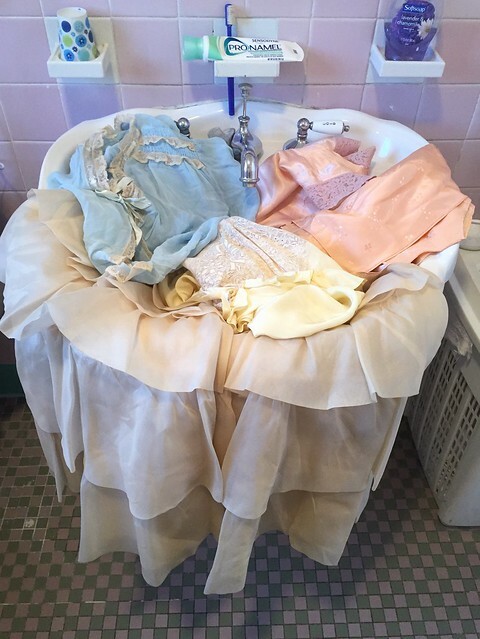 Also you win for the most aesthetically pleasing post on washing vintage. This post is truly a dream! 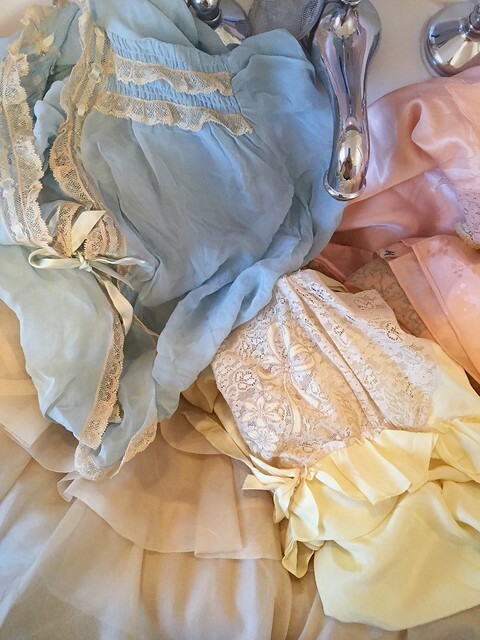 Your collection is truly dreamy ahhhh *__* Thank you for sharing this! And Carly is the best, right?! Laundry has never been this aesthetically pleasing. 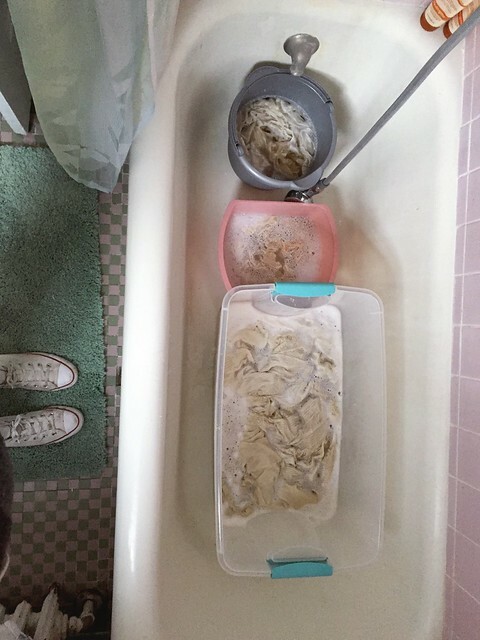 Thanks for post pictures of the most beautiful laundry ever hahaha. It's always a pleasure to see you've updated. This has inspired me to dig my most fragile threads out of the bottom of the laundry basket. I got bitten last summer when I managed to make green velvet bleed into a white chiffon skirt. Who knew green velvet could bleed? I'm glad to know I'm not the only won who finds cleaning up vintage quite satisfying. I had a similar mishap once when I managed to shrink a 30's black velvet dress. Sad times. A lovely looking collection you have, particularly the skirt at the end. Very interesting! You have a lot more patience and bravery than I do - I typically bring a seasons worth of dry clean only to the cleaners only to leave it there for a year (hey storage right?) I am sad there wasn't an Easter post this year, those are my favorites of yours!